This article shows how to configure Workshop Butler to subscribe and unsubscribe licensed trainers automatically from MailChimp lists. With Workshop Butler, you can subscribe licensed trainers to one or several MailChimp lists automatically. When you manually prolong an expired license. You update a license, making it inactive. Go to the account settings, select MailChimp in the left-side menu and click Connect. A chosen list must have only three required fields: First name, Last name and Email. This is a default setting for MailChimp. If you have more required fields, an automatic subscription fails. 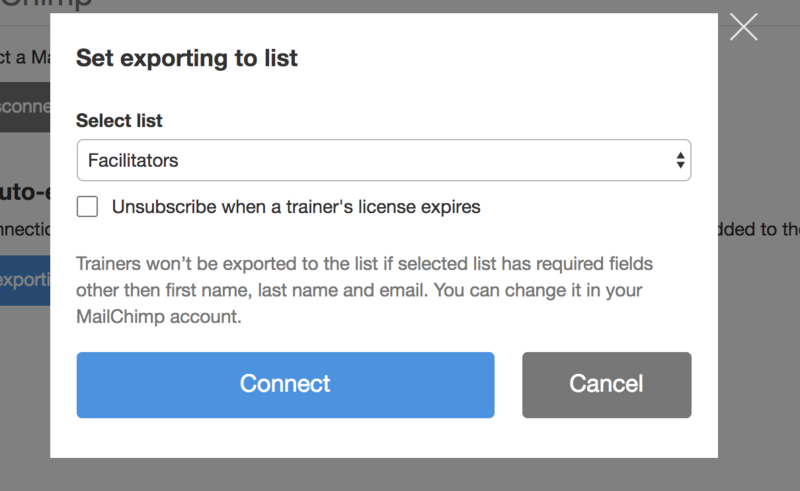 In case you want to remove trainers from the list when their license expires or is ended manually, check Unsubscribe when a trainer’s license expires flag. It’s common to have at least two newsletters: for the general public and for licensed trainers/facilitators. It’s okay for trainers to be subscribed to the former when their license ends. However, you would want to unsubscribe them from the latter one, when their license expires, and their payments stop. When a new trainer gets a license or the old one reactivates an existing one, they get subscribed to MailChimp lists.